Years of following writing careers have taught me that being a great short story writer translates into being a great novelist as often as having the ability to crack open a bottle of aspirin translates into being a great neurosurgeon. When I heard Rob Hart had a novel coming, I was curious because his short stories are very good and the man knows crime writing, but I was also worried about the transition. Well, Hart delivered, and did so in a way that makes New Yorked feel like anything but a debut. Ashley McKenna is a quintessential native New Yorker with a heart of gold and solid principles hidden under an unbelievable amount of layers of pain, regret, booze, and violence. He kicks around the East Village downing drinks, getting things done, remembering his father's death as a 9-11 hero, and hating the shifting nature of the city. Then his world is rocked a second time by death. This time, Chell, the woman whose unrequited love haunted him for a long time, is found dead. Right before she died, she left Ash a voice mail asking for help. That voice mail, along with too many unanswered questions and a blinding thirst for vengeance, send Ash into an anger-fueled trip through the five boroughs in search of the man who killed his friend. Along the way, he battles the past, his alcoholism, and his own nature while getting involved in a dangerous game and a war for the streets of the city. The first thing that should be said about New Yorked is that Hart pulls off two things that are truly rare in contemporary literature. The first is that he took a handful of cliches (e.g. hard drinking, a fedora, a tough guy who likes using his fists more than he likes using guns, etc.) and molded them into something entirely his that feels fresh and easily keeps the pages turning. The second is that he wrote a novel about New York that actually gets the city and the fact that there's something about it that no writer has or will ever be able to transfer to paper. This narrative is a textbook hardboiled private investigator novel, but it bobs and weaves to its own rhythm and thus evades becoming yet another pastiche that tries too hard. The second thing that must be said is that the characters that populate hart's world are memorable, and that's strange considering that the narrative is told in first person by a very unreliable narrator who's very angry and that bodies hit the floor regularly because no one is safe. Perpetual gritty bar dwellers, crossdressers, hipsters, bartenders, dancers, and dealers are all here and they are all memorable because they come together to paint an authentic picture of the Big Apple. Last but not least, the author nails the tough guy comebacks as well as regular dialogue, all of which helps keep up the solid pace the narrative sustains for almost 300 pages. Something that's not often brought up in reviews is the chuckle/nod combination. If a book makes you do both, it deserves to be recommended. New Yorked made me do those things more than once. The way Ash feels about things is not only understandable but almost contagious. I wanted to punch the hipsters as bad as he did. Similarly, readers won't have to be native New Yorkers to feel angry at the solid example of rampant gentrification Hart offers here. My only problem with New Yorked is that Hart sometimes seems to spend a few lines trying to make a hard scene harder when there's no need for it. The author understands the genre and this books is both proof of that and an homage to those who came before him, but he simply has too much talent to spend time letting us know how much booze was downed or how angry Ash is at the hipsters that want to turn his home into a Starbucks. There are passages about NYC here that demand a second reading and others that are reminiscent of Ellroy in their speed, harshness, and efficiency, so trying to make the tough guy look tougher is something that gets lost among all that infinitely superior storytelling. 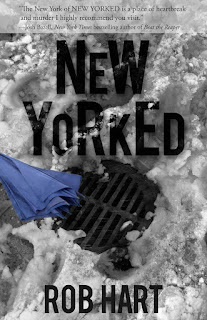 New Yorked is a novel about self discovery, dealing with loss, and the role of violence in our lives. It's also about how New York has changed and is still changing. My usual reaction to new crime series is the same I have to new zombie series: we need them as much as we need more new about the Kardashians. This time around, however, I'm excited to know that Ash McKenna is coming back to us soon. I suggest you get acquainted with him now.